I’m very excited to present the new Kester Black Spring/Summer collection! 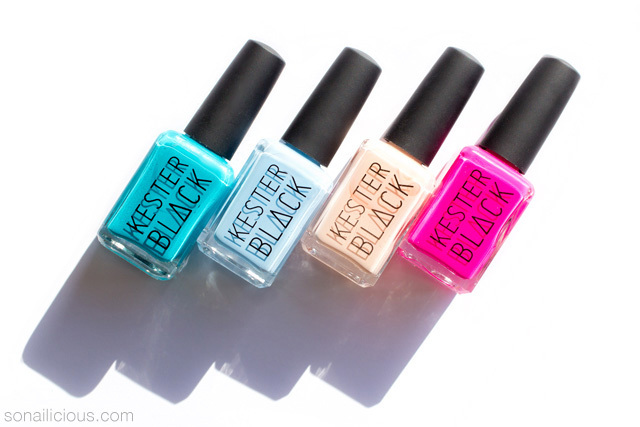 I decided to expand the SoNailicious Boutique to accommodate a few more of my favourite polish brands, starting with Kester Black! 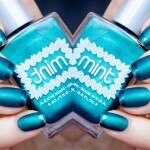 This Melbourne based polish brand takes ethically produced polishes seriously. Not only that, their colors are divine! I’ve been a huge fan of the brand ever since I tried it for the first time all the way back in 2012 and we’ve featured Kester Black numerous times here on SoNailicious, for instance here, here and here. As soon as I saw the new Kester Black collection colours I loved them and immediately decided that every nail art warrior needed access them! They are too pretty to stay confined to Australia so I added them to the SoNailicious Boutique mix. The vivid colours are super trendy and work exceptionally well together. You might have seen sneak peeks of several nail designs I’ve already created with this collection on Snapchat (username: SoNailicious). Now, let’s take a look at the colours first and we’ll go into the technical details in the full review below! Formula: The formula is cruelty-free, vegan and 10-free – which means it’s free from formaldehyde, toluene, DBP, camphor, formaldehyde resin, xylene, parabens, fragrances, phthalates, and animal derived or tested ingredients. Also, these polishes are water permeable and breathable! Which makes them Halal appropriate. The polishes are highly pigmented and moderately glossy but not very fast-drying. 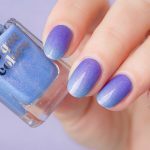 You’ll need 2 coats to get them fully opaque. Even the lightest colours Blossom and Cumulus yielded in fully opaque coverage in just 2 coats. 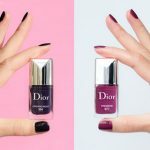 Application: The new Kester Black polishes feature flat, wide and rounded brushes, which is very similar to the brush in Dior polishes. It make it very easy to apply them flawlessly. Those with small nail beds may be able to get nail polish on in just one stroke. Finish: All 4 polishes are classic rich cremes, highly pigmented, all colours are opaque in 2 coats. Wearability: Super long lasting, with a good top coat these polishes can last up to 7 days. Nail Art: Great for any kind of nail art. And, lots of nail art coming your way! As I’m keeping one set to myself. Extra Notes: Surprisingly, Kester Black polishes have very gentle smell. They are not like all other polishes when you open the bottle and the entire room smells like polish. Also, these polishes don’t stain your nails! Even the intense Terrarium and Barbie left my nails in pristine condition, not a tiniest discoloration. * The pictured swatches below are with a top coat. Overall Impression: Needless to say, I’m loving this collection and if you ask me, it’s a must have. I’ll be keeping two sets for myself – don’t want to run out! 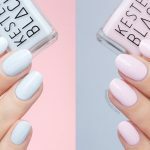 If you like classic creme polishes, crisp vivid colours and you’re into toxin/cruelty free & vegan then it’d be hard to find a polish that is more ethically produced than Kester Black. Availability: now here – US $15 / AUD $20 per bottle. The stock is very limited so I’d recommend buying them soon. They are already selling fast! What do you think about these colours? Have you tried Kester Black before?